1 of 1 Heat oven to 350 degrees F. Line a cookie sheet with parchment paper. 1 of 1 Place the sugar and ginger on a plate and mix until combined. Set aside. 1 of 2 Place the butter and sugar in the bowl of a mixer fitted with a paddle and beat until smooth and creamy. Add the egg and molasses, one at a time, beating well between additions. Scrape down the side of the bowl. Place the flour, ginger, baking soda, cinnamon and salt in a separate bowl, and mix well. Add to the butter mixture and beat until everything is well incorporated. Scrape down the sides of the bowl and beat again. 2 of 2 Break off small pieces and roll into 1-inch balls. Roll the balls in the Sparkly Ginger Sugar and place 2 inches apart on the prepared cookie sheet. Using your hand or the bottom of a water glass, press down until flattened. Transfer to 350 degrees F oven and bake until the cookies begin to brown at the edges, 12 to 15 minutes. Cool on the cookie sheet. Transfer the cookies to a wire rack and repeat with remaining dough. 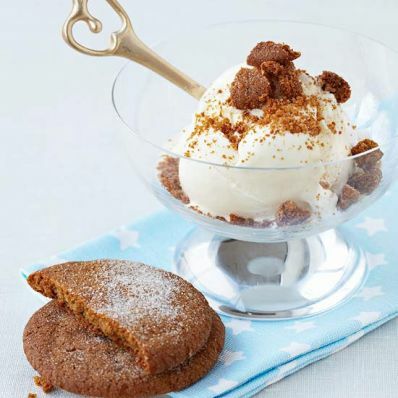 Serve vanilla ice cream topped with cookies, if desired.